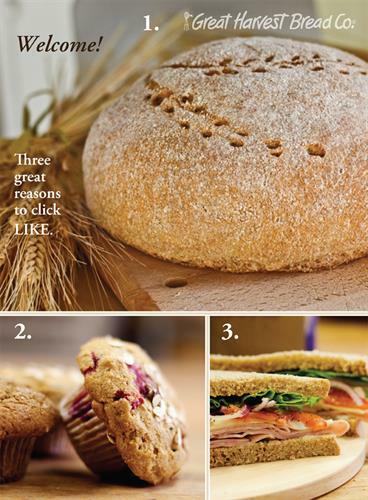 Great Harvest Bakery Café Hilliard is locally owned and operated. We are about customer experience and the promise of phenomenal tasting food made with freshly-milled whole grains and pure and simple ingredients. We are “Bread Heaven” and we live by this mantra. Our wheat is grown in Montana's Golden Triangle. It is stone-milled into fresh flour in our bakery then baked into phenomenal breads and goodies every day from scratch. We are not just “a bread store.” We are a Bakery Café where people can sit, enjoy, and savor the aroma of the thing that kindles their memories. Our sandwiches are unlike any other because someone is paying attention to the thing that makes a sandwich a “sandwich.” Our handmade breakfast biscuits, muffins, scones, and cinnamon rolls are made in the wee hours of the morning, served hot out of the oven to greet customers every morning. And even our amazing salads are made fresh every day. We are not “just another café” – we are also defined by our people, the friendly and caring people that produce and serve the amazing products. We have owners and team members who want to “serve” not just bake. We create a comfortable and enjoyable atmosphere; where simply, the aroma and friendly people bring our customers back to a place they love and remember. We believe in giving back to the community which delivers Great Harvest commitment to generosity. Generosity is a cornerstone of our culture, we do this not just because we believe in “doing good,” but also because we know our communities support us, and we want to reciprocate. 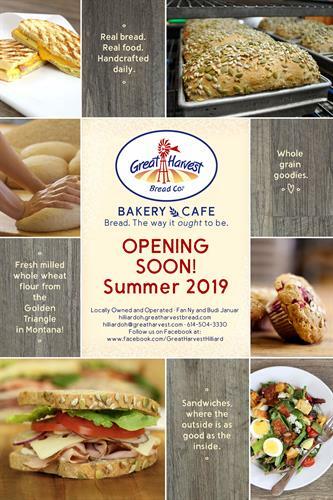 Great Harvest Bakery Cafe Hilliard is hiring!